This section is a one-switch accessible home for the likes of Whack-a-mole, Toy Grabbers, Fortune Telling machines, penny pusher games, novelty shooting ranges and more. In essence, anything that you might find in an amusement arcade past or present that is not a video game, nor a pinball machine, nor a fruit machine. If you are a games programmer and like the idea of bringing a fully accessible arcade to all, and perhaps developing something for this EM and Redemption area, please get in touch. Decent accessible games will be submitted automatically to the Game for Helen project. One switch version of LAI Games prize machine Stacker. Requires timing skills. Use F1 to cheat. Special Effect review for Slacker. Grab-a-toy crane type game. Requires fairly quick reactions. (C) 2005 FlyingmonkeyC Entertainment written by Carlos Ramos. Highly accessible Whack-a-Mole game. Play with one-switch using the SPACE BAR, two switches using SPACE and TAB or with a MOUSE compatible controller. Accessible to almost all. 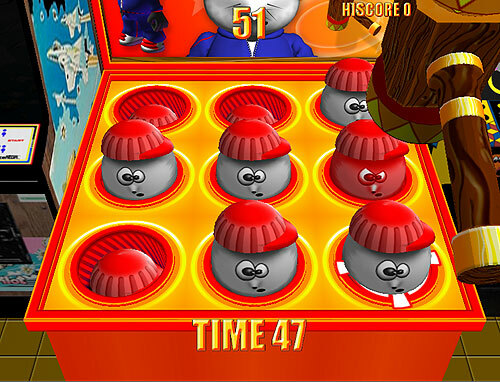 One switch version of the home and ICE manufactured arcade game Hungry Hungry Hippos for one to four players. XP only. Retro Arcade Museum: 1970's Arcade Museum with some great photos. Vintage Games: Pre 1977 Mechanical Games. Boing Boing: Electro Mechanical article. You Tube: Videos of electro mechanical machines and redemption games.